The One that Got Away is a debut effort from author Leigh Himes. I found it to be a charming and fun – kind of an adult take on “Freaky Friday.” This fun twist on a classic tale follows Abbey Lahey – exhausted, underappreciated mother who just really wants to carry a Marc Jacobs bag and feel like she has at least some semblance of her life together. Any moms out there relate? So when she sees a photo of a former could be flame, now a successful Philadelphia socialite, in a magazine, she wonders what it would have been like if they had ended up together. Thanks to a freak fall off the Nordstrom elevator (while returning the above bag) she’s about to find out. Suddenly Abbey Lahey is Abbey Van Holt – Philadelphia socialite married to congressional hopeful, Alex Van Holt (the one that got away). If there ever was a story about the age old saying, “You don’t know what you’ve got til it’s gone” this is it. Abbey finds herself attending black tie events, living in a lavish penthouse, married to handsome, successful and very wealthy man. But all of these things don’t make her happy and she yearns for her former life. 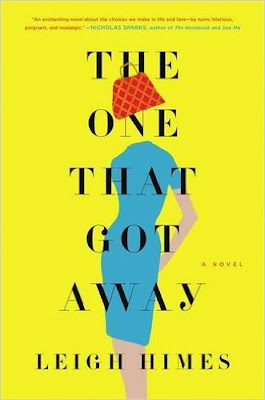 I had fun reading along while Abbey discovered who really was “the one that got away” and how to come to terms with her issues. The storyline is familiar and predictable, but with a fun new twist that I think fans of the chicklit genre will love, I know I did. So, now that it’s December(!) did anyone read along? If you did, what did you think? If you didn’t – go ahead and check this one out! I think you'll enjoy it!! Or Check your local library!